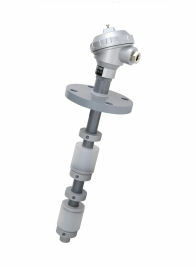 This float is very corrosion-resistant, and ideal for detecting multiple points in liquid chemicals, etc. Other types than standard reed switches are also available to match the specific use conditions. Models with a large float (YF-RP), a small float (YF-RP□S), and explosion proof versions are available. Changes can be made in the specifications (coupling method, material, etc.). Resins (PVC, PP, etc. ), that offer high resistance to corrosion, are used as material for the sensors.Can measure various liquid chemicals. One unit can detect liquid levels at a maximum of 7 points. The unit is very reliable and durable thanks in part to the use of the highly reliable reed switch. Ex. : Can be used with various applications, including controlling pumps, setting upper and lower limit alarms, and contributing to decreasing users’ total costs. *1: The Ln dimension means a length from the set position to the bottom of the screw. *2: The L dimension means the total length from the bottom of the screw. *3: Setting distance dimensions refers to the minimum dimension when two stoppers are used. *4: The L-Ln dimension refers to the difference between the final setting position (Ln) and total length. Note: The values for *3 and *4 are true when the specific gravity of the liquid is 1.0.